What if a character in the computer game you were playing suddenly became real? 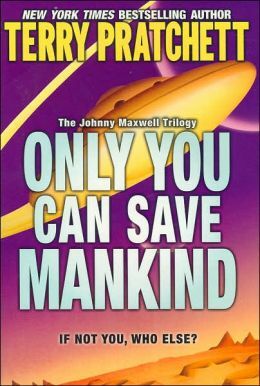 In The first of Terry Pratchett’s Johnny Maxwell trilogy, Johnny faces down aliens in “Only You Can Save Mankind.” Targeted for a middle school audience, Pratchett’s science fiction thriller has some elements appealing to adults, with Pratchett’s clever references to human foibles, including unhealthy food, politics, and parenting, but overall, Johnny’s struggles with making friends, being a nerd, and generally trying to understand the adult world, fit the formula for a coming of age adventure. I found this slim paperback, surrounded by shelves of Terry Pratchett books in the upstairs maze in The Last Bookstore. The title attracted me and had me wondering – can mankind be saved? Pratchett offers a few funny alternatives in his war against the aliens, and the action gets exciting as the story heads to its climax. You might never win, but at least you could try. If not you, who else? How long can two little girls hide a dead old aunt, as they manage the Linger Longer Cottage Colony in Cape Cod in Sara Pennypacker’s tween novel Summer of the Gypsy Moths? With humor, compassion, and a dog named Treb, Pennypacker’s heroine combines the heart of a child with the maturity of an adult. When Stella’s spirited mother runs off to find happiness, she leaves Stella with her great-aunt Louise, caretaker for a string of summer cottages on the Cape. Louise decides to foster a Portuguese girl, Angel, as a companion and friend for the little girl. No one expects Louise to die, and when she does, the young girls decide that life alone would be better than the unknown possibilities of an orphan home – and they know how to keep a secret. Once you get past the macabre scenes of a dead body and the unlikely burial, the tale of friendship and responsibility is endearing, and you will be cheering for the girls to succeed. Stella’s penchant for Heloise’s Helpful Hints substitutes for motherly advice as the two girls clean the cottages between guests; at times, those helpful hints offer funny possibilities – who knew Febreze laundry odor eliminator would help with the smell of a dead body. The girls set up a baby-sitting service, dig for clams on the beach, and try to stop an infestation of caterpillars in blueberry bushes planted years ago by Stella’s mom. The ending has everyone living happily ever after, with the two wily girls demonstrating their resourcefulness. Pennypacker has been compared to Beverly Cleary with growing-up stories that have a message – for both adults and children. 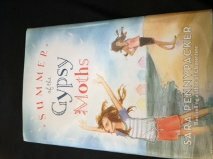 With moments that will have you aching for their loneliness and laughing at their gumption, Summer of the Gypsy Moths is worth the read.